FUNAI 2017/2018 Postgraduate Programme Admission Form. Applications are welcomed from suitably qualified candidates for admission into the under-listed programmes (full-time, part-time and weekend) in the School of Postgraduate Studies, Federal University Ndufu-Alike, Ikwo (FUNAI) for the 2017/2018 academic session. To be eligible for admission into a postgraduate programme in FUNAI, all candidates must possess a minimum of credit pass in O’ level English Language. All prospective applicants must possess at least 5 O’ level Credit passes at not more than 2 sittings from WAEC, GCE, NECO or TC II. Also, candidates seeking admission into the Faculties of Science, Basic Medical Sciences and Management and Social Sciences must have a minimum of a credit pass in Mathematics. Any candidate who does not satisfy the O’ level requirements for the courses of choice shall not be considered for admission. 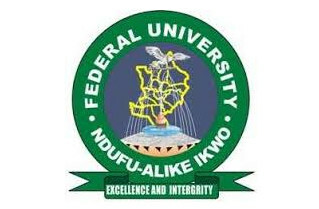 hold a third class degree from the Federal University Ndufu-Alike, Ikwo or from an equivalent institution recognized by Senate, with a CPGA not below 2 on a 5-point scale, or hold a Higher National Diploma (HND) from a recognized institution, passed at lower credit level in a related discipline. 1. be graduates of the Federal University Ndufu-Alike, Ikwo or equivalent institutions recognized by Senate, who hold a Second Class (Hons. ), Upper Division degree in relevant disciplines. 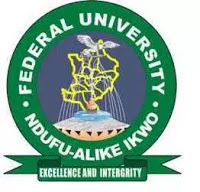 2. hold the Postgraduate Diploma (PGD) of the FederalnUniversity Ndufu-Alike, Ikwo or PGD from equivalent institutions recognized by Senate with a CPGA of not less than 4.0 on a 5-point scale. Interested candidates who meet the requirements outlined above should obtain application forms from the Secretary, School of Postgraduate Studies, NEEDS Assessment Building, FUNAI, after the payment of an application fee of N15,000 through Remita and obtaining RRR number. Payment should be made in favour of Federal University Ndufu-Alike Ikwo at any bank. 1. Candidates should request their institutions to forward their academic transcripts in sealed cover to the address above not later than the closing date. 2. Candidates are also required to provide reports from three referees, one of whom should be their former Head of Department. Any candidate whose transcript is not received will not be considered for admission. All completed applications, academic transcripts and referees’ reports must reach the Office of the Secretary, School of Postgraduate Studies not later than 31st January, 2018 to be considered for the 2017/2018 admission exercise. 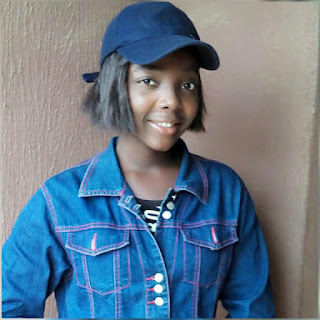 FUNAI Hostel Allocation Lists for female and male newly admitted students of the institution for the 2017/2018 academic session has been posted online. According to the management of Federal University Ndufu-Alike Ikwo, the list contains only names of students who were newly granted admission. Students given bed spaces should endeavour to complete their registration and check into the hostels within the next 2 weeks from the date of this publication. All bed spaces not claimed on or before Monday 27th Nov, 2017 will be revoked by 12 midnight on that day. Others are waiting.